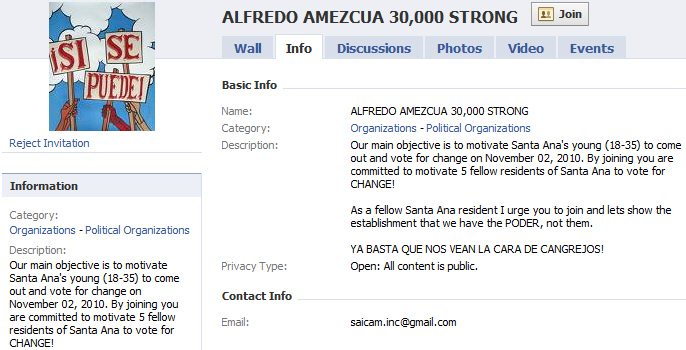 A new Facebook group is calling itself “Alfredo Amezcua 30,000 Strong,” and asking members of the community to join their campaign to elect Amezcua as our next Santa Ana Mayor. They currently have three members. Our main objective is to motivate Santa Ana’s young (18-35) to come out and vote for change on November 02, 2010. By joining you are committed to motivate 5 fellow residents of Santa Ana to vote for CHANGE! As a fellow Santa Ana resident I urge you to join and lets show the establishment that we have the PODER, not them. YA BASTA QUE NOS VEAN LA CARA DE CANGREJOS! Amezcua won a seat previously on the Rancho Santiago Community College District’s Board of Education, in 2004, in Area 1, according to Smart Voter. He came in second out of five candidates, with 21.8% of the vote. Former Santa Ana Councilman Brett Franklin came in last in that race, with 17.6% of the vote. Amezcua resigned from the Rancho Board in 2008. He served for six years on the Board, having first been appointed to the Board. At the time he cited a need for “fresh ideas,” according to the Santa Ana College newspaper, El Don. Presumably Amezcua now has some fresh ideas as a mayoral candidate. However, his campaign website is still absent any “issues,” as you can see at this link. Amezcua is running against incumbent Mayor Miguel Pulido, who has been on the Santa Ana City Council for over 20 years. Public Safety: Santa Ana continues to lower crime and improve public safety. Our crime rate is now one of the lowest of any city our size in America. Economic Development: Santa Ana continues to attract and retain jobs and businesses. We have one of the most vibrant economies in Orange County. Neighborhood Associations: Increased communication with city administration, supporting newsletters, and neighborhood events. City Enhancement: Enriched the image, the cultural atosphere, and protected the economy of our city by transforming our community. Partnership With Schools: Helped secure over $320 million in funding towards Santa Ana Unified for classrooms and repairs. Streets & Traffic: Repaved and repaired miles of streets through Santa Ana, implemented a “Smart Street” program that eased traffic congestion, beautified major traffic arteries, and built the Gateway Arc to our city. So Big Al is fresh out of ideas for SAC but is ready to change the whole city of Santa Ana. I’m no fan of Pulido but I think Al’s been sampling that weed he plans on giving away!